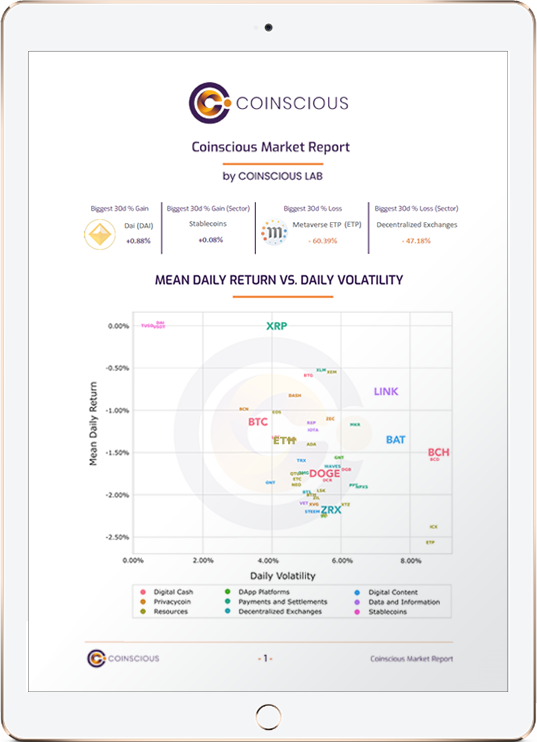 We’re excited to share our first Coinscious Market Report by Coinscious Lab. Released bi-weekly, this report aims to identify broad trends in the cryptocurrency market. In order to reflect the latest developments in this fast-paced and volatile market, the reports are planned to focus on metrics derived from a 30-day rolling window of data, this time from October 23, 2018 to November 22, 2018. Our universe of analysis includes 50 of some of the most widely used and traded cryptocurrencies and groups them into sectors that reflect similar utility and valuation models. Through analysis of the recent historical performance of individual cryptocurrencies as well as their sectors, we provide a framework for analysis where investors can identify outperforming cryptocurrencies or sectors by comparing their performance relative to peers.